On the walls of the Polk County Police Department are pictures and medals of a fallen comrade, of a mother, a daughter, a dedicated friend. It is hard for fellow officers – Chief Kenny Dodd included among those who still shed tears to this day – to look at the smile of Detective Kristen Hearne and not feel the pain of her loss, and a year later the emotional wounds remain fresh. "A lot of guys are still sad and miss Kristen, including myself," Dodd said. "They are still mourning her loss. She is still missed very much." This weekend the officers who served alongside Det. Hearne have a chance to come together and share in their grief, and also do some good for the community as a whole in ceremonies and events planned to honor her life on Saturday. That includes a noon ceremony at the Law Enforcement Memorial outside of Polk County Courthouse No. 1 in Cedartown. The event will be open to the public. The memorial ceremony is being organized with the help of Polk County Coroner Tony Brazier, Litesey Funeral Home and the police department. Earlier this weekend starting at 9 a.m., a blood drive being organized by Officer Andy Anderson will get underway, with Dodd set to offer up a prayer and the department to hold a moment of silence before they begin taking donors. Along side Blood Assurance Anderson is receiving help from the Department of Natural Resources and other agencies to provide outreach and education opportunities for youth to enjoy such as the Touch a Truck program and even a tour of a helicopter while adult donors give blood. Participants will also be served lunch, a t-shirt and those who are 18 and older are automatically included for a Yamaha Sound Bar drawing at the conclusion of the blood drive. The drive wraps up at 3 p.m.
Remembrances of Hearne continue following her slaying late last September, when she and Officer David Goodrich were involved in the investigation of a suspicious vehicle parked on Santa Claus Road reported by a resident. When Hearne and Goodrich began seeking additional information about the Ford Escape they found parked off the roadway, Seth Spangler and Samantha Roof stepped out of the woods, and after initial contact, Spangler pulled a gun and began to fire at Hearne and Goodrich. Hearne, who didn't have her vest on at the time, was shot in the exchange as well as Goodrich, who did. He returned fire and then when Spangler and Roof fled, called for help and tried to do what he could for Hearne until paramedics arrived. The process toward a trial is already underway, and both enter not guilty pleas at a hearing earlier in the year. The 29-year-old detective began her law enforcement career as a deputy with the Floyd County Sheriff's office in 2008, and later joined the Polk County Police first as a patrol officer in 2012, then was promoted to detective in 2013. She left behind her husband, former Lt. Matt Hearne with the Aragon Police Department, and her son Isaac along with her parents, siblings, in-laws and extended family. Hearne also left behind fellow officers who in the months since her death still find themselves having a hard time coping with what happened. One result that is making a difference is a focus on officers taking extra precautions when on the job patrolling Polk County. "The guys are a lot more cautious than they used to be," Dodd said. "It has caused everyone to be more aware of their surroundings and the situation when on calls. Now instead of one car responding, we always have two. They're working together a lot more." Dodd said that Hearne would appreciate the tributes, but that he believes ultimately she would want her memory to live on in the hearts of those who loved her as a mother dedicated to her son, and a public servant dedicated to her work and the community. "She loved being a mother to Isaac, and she loved being a police officer," Dodd said. Walmart officials said an open investigation prevents them from commenting on files previously found at city hall in Aragon that included un-cashed checks and other documents from the tenure of former City Clerk Lori Dunn. 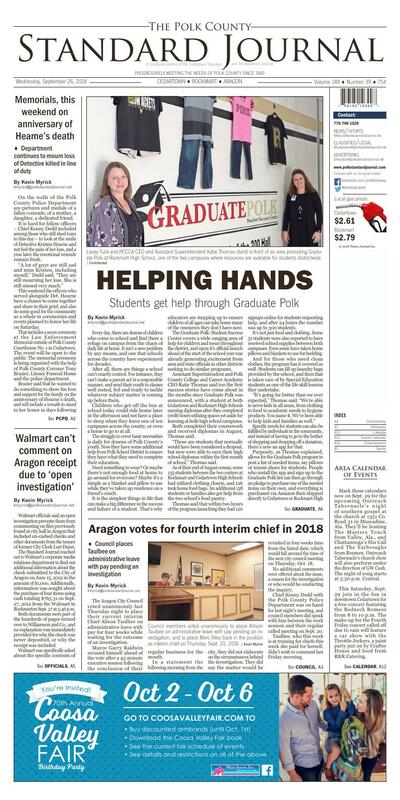 The Standard Journal reached out to Walmart's corporate media relations department to find out additional information about the check submitted to the City of Aragon on June 15, 2012 in the amount of $1,000. Additionally, information was sought about the purchase of four items using cash totaling $765.31 on Sept. 27, 2012 from the Walmart in Rockmarton Sept. 27 at 5:46 p.m. Both documents were part of the hundreds of pages turned over to Williamson and Co., and no explanation was immediately provided for why the check was never deposited, or why the receipt was included. the receipt, which in notes on the purchases included "OB IPN4S" for $34, a laptop case for $34, "notebooks" listed for $598.00, and a $69 2-year service agreement. The receipt also noted the purchase was made with $780.00 in cash. When Walmart replied to a follow-up request about the two items, they said the check was passed along to the appropriate internal authorities, and that no information could be provided at this time since the receipt was part of an open investigation. A second inquiry was made to see who was investigating the receipt, but as of last Thursday morning no reply was received. A request was made to the City of Aragon to inspect the equipment, or provide documents to show it was a purchase approved and used by the city, and receipt of that request was made last Thursday morning, Sept. 20 as well, along with another request for additional documents. Former Mayor Ken Suffridge was asked about his recollections at the time about purchases from Walmart using cash, and whether he approved them. Suffridge said he wasn't in the office that day, and that a review of daily diaries he kept during his tenure as mayor includes nothing about a purchase. "I have serious doubts if this is something I authorized, especially a cash purchase," Suffridge said in an e-mail response inquiring about the purchase. "If I recall, when I came on board, Lori (Dunn) was using a "limited" credit card that was usually at its limits." Additional documents requested from the City of Aragon following the Williamson and Company report are still under review, and inquiries are being made to those who made payments for garbage accounts, citations and taxes by check, but were never cashed. Those documents were found in May 2017 in a filing cabinet following Dunn's resignation from the city. This came more than two years after Suffridge gave her the choice of resigning or taking a lower position with the city following a probationary period over her handling of financial matters. Georgia Bureau of Investigation officials last year said they were waiting on city officials to gather information before they began any inquiry into the matter after the checks were discovered last summer. No change has been announced about that position. Lacey Tuck and PCCCA CEO and Assistant Superintendent Katie Thomas stand in front of an area promoting Graduate Polk at Rockmart High School, one of the two campuses where resources are available for students districtwide. Every day, there are dozens of children who come to school and find there a refuge on campus from the chaos of daily life at home. It isn't a new problem by any means, and one that schools across the country have experienced for decades. After all, there are things a school can't exactly control. For instance, they can't make a parent act in a responsible manner, and send their youth to classes well rested, fed and ready to tackle whatever subject matter is coming up before them. Children who get off the bus at school today could ride home later in the afternoon and not have a place to sleep when they leave one of ten campuses across the county, or even a home to go to at all. The struggle to cover basic necessities is daily for dozens of Polk County's youth. Now they have some additional help from Polk School District to ensure they have what they need to complete their education. Need something to wear? Or maybe there's not enough food at home to go around for everyone? Maybe it's a simple as a blanket and pillow to use while they've taken up residence on a friend's couch. It is the simplest things in life that can make a big difference in the success and failure of a student. That's why educators are stepping up to ensure children of all ages can take home many of the resources they don't have now. The Graduate Polk: Student Success Center covers a wide ranging area of help for children and teens throughout the district, and upon it's official launch ahead of the start of the school year was already generating excitement from area and state officials in other districts seeking to do similar programs. Assistant Superintendent and Polk County College and Career Academy CEO Katie Thomas said too the first success stories have come about in the months since Graduate Polk was announced, with a student at both Cedartown and Rockmart High Schools earning diplomas after they completed credit hours utilizing spaces set aside for learning at both high school campuses. Both completed their coursework and received diplomas in August, Thomas said. "Those are students that normally would have been considered a dropout, but now were able to earn their high school diplomas within the first month of school," Thomas said. As of their end of August census, some 135 students between the two centers at Rockmart and Cedartown High Schools had utilized clothing closets, and 126 took home food bags. An additional 138 students or families also got help from the two school's food pantry. Thomas said that within two hours of the program launching they had 120 signups online for students requesting help, and after 24 hours the number was up to 300 students. It's not just food and clothing. Some 51 students were also reported to have received school supplies between both campuses. Even some have taken home pillows and blankets to use for bedding. And for those who need clean clothes, the program has it covered as well. Students can fill up laundry bags provided by the school, and then that is taken care of by Special Education students as one of the life skill lessons they undertake. "It's going far better than we ever expected," Thomas said. "We're able to serve kids in all areas, from clothing to food to academic needs to hygiene products. You name it. We've been able to help kids and families as well." Specific needs for students can also be fulfilled by individuals in the community, and instead of having to go to the bother of shopping and dropping off a donation, there's now an app for that. Rockmart High Schools. Find the app's homepage for more at Purposity.com. "We've created a most-needed donation list, mostly food items," Thomas said. "We've had a lot of businesses and industries also help with this and have food drives within as well to help us." Additionally, a need's list is available on www.polk.k12.ga.us of needs for the program. In preparation for the winter season and a new set of clothing to go in the closets, an event was held over the weekend on Saturday and will come up again this Thursday for those who are in need to have a chance to "shop" for some items to clear space. Students and parents can visit either campus from 3:30 to 6:30 p.m. to take part. Also the help to families extends to parents as well, especially those where English is a second language. Classes are coming up starting on Oct. 16 through next March free of charge thanks to Gildan Yarns, who purchased materials for the class and provided additional funds to cover the costs of an instructor. They'll be held Tuesday or Thursday evenings at Cedartown High School, with one class per week. Those interested can contact Susan Oswalt at 770-7482510, at extension 110 for more information on how to participate. Students at the elementary and at Rockmart Middle School also have access. The program is confidential, just like with the Dawg House program at Cedartown Middle School, and will remain so for all students. The hope is that they'll ask for help, but won't have to experience the stigma sometimes created in the school environment when youth receive donations from the food pantry or clothing closet, for instance. It isn't just about the physical needs of students either. The program also seeks to meet the needs of students academically by giving them flexibility in courses, so if they have to work to help make ends meet they don't miss out on the opportunity to earn their high school diplomas. This is how the two students who graduated in August were able to finish their requirements by being able to tackle coursework when they can. So as Thomas explained, if students need to work two hours a day here, or a longer amount of time later while in a non-traditional classroom setting, they have that flexibility. Additionally, with the partnership with Willowbrooke at Tanner to provide help to students suffering through mental health problems, it allows for the district to reach their goal of not just focusing on academic issues, but what they can do to help the whole of a child. Thus far, some 51 students district-wide utilized those services in one capacity or another. Officials have also created the space and time for students to have group therapy sessions as well. Those include groups for students who have a family member who is incarcerated, battling substance abuse and who have mental, physical or emotional problems that impact the student. Individual counseling services cover a wide range of topics, from cutting and selfharm, depression and more. Surveys have been given out previously to see what kinds of needs Graduate Polk can fill, and additional surveys are going out to students to see what more can be done. "One of the things we realize here is that we can't meet their educational needs until their basic needs are met," Thomas said. "We want to serve that whole child, and this has enabled us to do that, and we're grateful for our success so far and we look forward to many more opportunities to serve Polk School District students and families." Tuck, a recent addition to the school system, said she was glad to be taking part in the program. "We are excited to be able to provide wrap around services to our students," she said. "We want to be able to meet their basic needs and help them prepare for the future." Anyone who wants to donate clothing, food or other items in need and don't want to use the app can make deliveries to either Cedartown or Rockmart High School front offices during school hours, or call Tuck at 770-845-9539. Visit fb.me/graduatepolk to learn more also about upcoming volunteer opportunities as well. Council members voted unanimously to place Allison Taulbee on administrative leave with pay pending an investigation, and to place Marc Riley back in the position as interim chief on Thursday, Sept. 20, 2018. The Aragon City Council voted unanimously last Thursday night to place their current interim Chief Alison Taulbee on administrative leave with pay for four weeks while waiting for the outcome of an investigation. Mayor Garry Baldwin recused himself ahead of the vote after a 45-minute executive session following the conclusion of their regular business for the month. In a statement the following morning from the city, they did not elaborate on the circumstances behind the investigation. They did say the matter would be revisited in four weeks time from the listed date, which would fall around the time of the next city council meeting on Thursday, Oct. 18. No additional comments were offered about the issue, a reason for the investigation or who would be conducting the inquiry. Chief Kenny Dodd with the Polk County Police Department was on hand for last night's meeting, and council members did speak with him between the work session and their regular called meeting on Sept. 20. Taulbee, who this week is at training for chiefs this week she paid for herself, didn't wish to comment last Friday morning. Marc Riley was voted unanimously to serve as the interim chief. Baldwin first submitted the name of Sgt. Michael Evans to take over the position, but no council member would put up a motion to approve. Taulbee later followed up to add in a statement on the record that "(Marc) Riley was on active administrative leave for at least one or more gross violations of policy. Why was he chosen over Evans, who has an impeccable record and a recent commendation?" She added that "Mayor (Baldwin) was totally aware of reasons why Riley was placed on admin(istrative) leave. I still have no ideal why I am. No reason stated, only that there is "an internal investigation."" With Taulbee's suspension, Riley and Evans are the last two officers serving in the Aragon Police Department. Council member Candace Seiz had initial questions during the work session about repairs paid by Taulbee out of pocket for a repair to a tire and a seat belt on the police cruiser she uses as a take home vehicle. She said that in her inquiry about the spending, she found that it wasn't approved by the city's Financial Consultant Rick Astley and that Taulbee had paid much higher prices for the equipment repairs than she would have paid locally. According to Seiz, Taulbee paid more than $150 over what it would have cost to patch the tire and at least $77 more for the seat belt repair via Peach State Ford. Taulbee took the vehicle to a Ford dealership close to her home in Blue Ridge instead. Seiz felt the city "was ripped off" by the repair costs. "I understand what's done is done, but my concern is that we're trying to save money," Seiz said. Baldwin explained that he approved of the repairs, but thought they were being undertaken by Public Works Superintendent Daniel Johnson, and not outside of the county. Council member Amy Causey cited her own concerns about the issue, and that employees should be more careful about decisions such as these when the city's budget is tight. She added that Baldwin needs to provide more information about incidents like the repair. "Had I not been in the office at the time, I wouldn't have known about it," Causey said. Taulbee was reimbursed for the cost of the repairs. The council ahead of the decision to put Taulbee on administrative leave also discussed in their work session the possibility of gathering a panel appointed by the council to evaluate candidates for the Aragon Police Department Chief's position. Seiz argued that because Baldwin had no previous background in law enforcement, a panel including officers or chiefs from other agencies would provide a real assessment of candidates to consider for the job. Causey asked "Is there any other city where the mayor hires for the police department? Are you qualified to hire in that kind of department? I don't see how you'd be qualified to do that job." Seiz also wanted to bring up a more specific personnel issue during the work session, and during the council meeting called for an executive session at the tail end of Thursday's session, and ended with the decision to place Taulbee on leave. The decision marked the fourth change of command for the city this year. Aragon began 2018 with Riley as chief, then after a demotion in February replaced him with Brad Loyd. Loyd resigned in July to be replaced by Taulbee as interim, and then now Riley again for a second time. Mark those calendars now on Sept. 29 for the upcoming Outreach Tabernacle's night of southern gospel at the church at 1351 Co. Road 31 in Muscadine, Ala. They'll be hosting The Masters Touch from Valley, Ala., and Chattanooga's His Call and The Yarbroughs from Bremen. Outreach Tabernacle's church choir will also perform under the direction of GW Cash. The night of song starts at 5:30 p.m. Central. This Saturday, Sept. 29 join in the fun in downtown Cedartown for a free concert featuring the Redneck Romeos from 8 to 10 p.m. The make-up for the Fourth Friday concert called off due to rain will feature a car show with the Throttle Jockeys, a paint party put on by Craftsy House and food from R&R Catering. Bethel "Crossroads" Baptist Church in Taylorsville is hosting their "Festival in the Field" this Saturday, Sept. 29 from 8 a.m. to 3 p.m. The event includes a flea market, free refreshments, fun and games and organizers ask to bring a coat to donate to their drive. The church is located at 450 Iron Hill Road, Taylorsville. Halloween Hoopla continues next week on Oct. 5 for Spooky Stories at the Library. Visit polkgeorgia.com for more information about the Halloween Hoopla and other events on the calendar through the end of October. Learn more about diabetes and how to eat healthy with the disease in an upcoming class being held on Thursday, Oct. 4 from 4 to 6 p.m. at the Nathan Dean Community Center in Rockmart (604 Goodyear Ave.) The event being held by the Polk County Extension Office includes a lot of useful information about the disease, risk factors and healthy habits. Preregistration is required by Sept. 27. Those who attend are entered into a drawing for a FitBit. Contact 770-749-2142 or e-mail uge2233@uga.edu to take part. Bethel "Crossroads" Baptist Church in Taylorsville is hosting Cooper and Princess Preslie to present Our Pastor book signing and dedication on Saturday, Oct. 13 from 10 a.m. to 2 p.m. Books are available for purchase and signing on the porch, along with free refreshments and activities for youth. Organizers also ask that participants bring a coat for the church's drive. Bethel Baptist Church is located at 450 Iron Hill Road, Taylorsville. Get ready for the annual Riverwalk Festival in Rockmart along the Euharlee coming up on Saturday, Oct. 20 in Rockmart's Seaborn Jones Park. Vendor registration is underway now, and those interested in taking part can visit rockmart-ga.gov for more information, or call 770-684-2706 to talk to special events coordinator Jeff Holstein. Admission to the festival is free for the general public. October is Clergy Appreciation Month, and a celebration is planned for a Clergy Connection Breakfast hosted by Polk Medical Center on Thursday, Oct. 4 at 7:30 a.m. Guest speaker for the event is Judge Mark Murphy. Mark those calendars and share with clergy contact and plan to join for the morning event. The event is being sponsored jointly by Polk Medical Center and the Polk County Chamber of Commerce. For more information, contact director@polkgeorgia.com. Cedartown's 41st annual Fall Festival is coming up on Saturday, Oct. 6, 2018 from 9 a.m. to 3 p.m., and applications are now open for vendors to sign up and take part. Arts and Crafts vendors are $40, food vendors $50, and booths for information only are $25. Children's activities are $75. Additional fees are required for power and drinks. Find forms on downtowncedartown.com to fill out and return to the Downtown Cedartown Association as soon as possible to be a vendor. Patrons can enjoy the parade, festival and more free of charge. Call or e-mail Ramona Ruark, Main Street Director at 770-748-2090, or e-mail her at rruark@downtowncedartown.com. Join the Cedartown-Polk County Humane Society for their annual Spayghetti Dinner, this year being hosted by the First Presbyterian Church of Cedartown on Saturday, Oct. 20 from 4 to 8 p.m. It's a dine-in or take-out meal, and a 50-50 raffle is also being held. $10 per person. Call Charlotte Harrison at 706-252-4412 for more information. The Harrell-Weaver Reunion is coming up in October, and family members are invited to come take part in the annual gathering. Relatives are asked to come to Fairview Baptist Church in Rockmart on Saturday, Oct. 13 from 11 a.m. to 4 p.m. Bring food enough to feed immediate family members, and additional to share. E-mail Sheila.stanczak@spsx.com for more information. Get tickets now for the upcoming Farm to Table on Marble, set for Oct. 6. The dinner will take place in downtown Rockmart in the outdoors, with tickets starting at $60 for individuals or $225 for a whole table of six, stretching 200 feet in total. The meal will feature locally grown products, and will start at 6 p.m. Purchase tickets now by contacting Shonna Kirkpatrick at shonnakirkpatrick@gmail.com, Dan Bevels at dbevels@floyd.org, or to take part as a sponsor by emailing director@polkgeorgia.com. Celebrate the Bible Month September with us! Facts and testimonies from and about the Bible! The event is coming up this Thursday, Friday and Sunday, Sept. 27, 28, and 30, from 4 to 7 p.m. at Holloway Park (in front of the Court House). Bible displays and much more. More Info at: 770-748-0077 or 770-715-0419, or by visiting http://www.sda1844. org; www.biblewell.org. The event is being put on by the International Missionary Society of Seventh Day Adventist, Reform Movement. The Polk County Democratic Committee meets on the second Saturday of every month at 9:30 a.m. During even numbered months the group meet at The Rockmart Library at 316 N. Piedmont Ave., Rockmart, and during odd numbered months the party meet at the Cedartown Welcome Center, 609 Main St., Cedartown. All are welcome to take part! Check out more information at the Polk County Democratic Committee by searching for them on Facebook.